This report by Persistence Market Research examines the global peripherally inserted central catheters market for the period 2016–2024. The primary objective of the report is to offer updates and information related to market opportunities in the global peripherally inserted central catheters market. This comprehensive market study demonstrates the various dynamics that are expected to influence the current environment and future status of the global peripherally inserted central catheters market over the forecast period. Peripherally inserted central catheters are medical devices used to infuse fluids and medication directly into the veins of the human body or draw blood samples for testing purposes. Peripherally inserted central catheters are inserted into the patient’s body using a needle that can be removed once the catheter is in place. Thereafter, the tip of the peripherally inserted central catheter is allowed to rest at the large vein junction in close proximity to the heart with the help of radiological devices. The report begins with a market overview followed by key definitions and provides information on the market value share of the global peripherally inserted central catheters market. The subsequent sections analyze the global peripherally inserted central catheters market on the basis of product type, design, end user, and region and provide a comprehensive market forecast for the period 2016 – 2024. 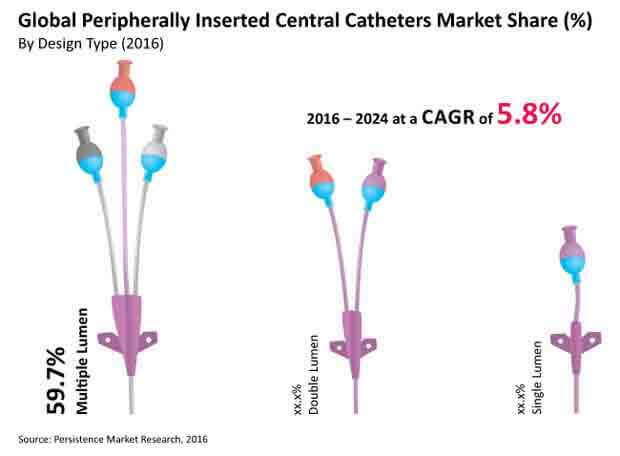 This study further discusses key regional trends contributing to the growth of the global peripherally inserted central catheters market and analyzes the degree to which drivers are influencing the market in each region. The forecast presented in this report assesses the total revenue generated across the global peripherally inserted central catheters market. In order to offer an accurate forecast, the report begins by sizing up the current market, which forms the basis of how the global peripherally inserted central catheters market is likely to perform in future. The report takes into account extensive secondary research to determine top industry players and overall market size. Region wise and segment wise data has also been acquired through interviews with key stakeholders in the global peripherally inserted central catheters market. Data gathered through primary and secondary research is validated by the triangulation method and further scrutinized using advanced tools to obtain useful qualitative and quantitative insights. Given the ever-fluctuating nature of the global economy, the report not only takes into account forecasts conducted in terms of CAGR, but also analyzes the market on the basis of key parameters such as year-on-year (Y-o-Y) growth to understand market predictability and to identify the right opportunities across the global peripherally inserted central catheters market. Another key feature of this report is the analysis of all key segments in terms of absolute dollar opportunity, traditionally overlooked while forecasting the market. Absolute dollar opportunity is critical in assessing the level of opportunity that a provider can look to achieve, as well as to identify potential resources from a sales and delivery perspective in the global peripherally inserted central catheters market. Further, to understand key market segments in terms of growth and performance, Persistence Market Research has developed the global peripherally inserted central catheters market attractiveness index to help providers identify real market opportunities across the global peripherally inserted central catheters market. Peripherally inserted central catheters constitute a single subtype of catheters that are specifically used for IV administration especially for continuous therapy ranging from more than a week to less than five weeks. The indications for peripherally inserted central catheters include chemotherapy, parenteral nutrition, blood sample withdrawal, and many more. Depending upon the duration of therapy and type of the disease indication the choice of peripherally inserted central catheters can be made for insertion. In this report we have categorized peripherally inserted central catheters only in two types namely power injected peripherally inserted central catheters and conventional peripherally inserted central catheters. The global peripherally inserted central catheters market is projected to register a CAGR of 5.8% during the forecast period (2016 – 2024) in terms of value. Global peripherally inserted central catheters market value is expected to increase to US$ 1058.6 Mn by the end of 2024. Growth of the global peripherally inserted central catheters market is mainly driven by increasing healthcare expenditure, robust reimbursement policies, increasing preference for peripherally inserted central catheters by healthcare physicians, and increasing number of diseases requiring the application of peripherally inserted central catheters. However, factors such as increasing usage of midline catheters, lack of specialized professionals for catheterization, and high risk of bloodstream infections and deep vein thrombosis are likely to hamper the growth of the global peripherally inserted central catheters market over the forecast period. Technological advancements in peripherally inserted central catheters and recent demand based innovations such as the introduction of anti-microbial peripherally inserted central catheters and anti-thrombogenic peripherally inserted central catheters will define the future landscape of the global peripherally inserted central catheters market. The Power Injected Peripherally Inserted Central Catheters product type segment is estimated to account for 82.3% revenue share of the global peripherally inserted central catheters market by 2016 end. This segment is anticipated to register a CAGR of 6.0% during the forecast period. The Multiple Lumen design segment dominated the global peripherally inserted central catheters market in revenue terms in 2015 and is projected to continue to do so throughout the forecast period, registering a CAGR of 6.7% in terms of value. The Hospitals end user segment is estimated to account for 69.1% revenue share of the global peripherally inserted central catheters market by 2016 end and register a CAGR of 6.0% during the forecast period. The global peripherally inserted central catheters market is segmented into the five key regions of North America, Latin America, Europe, Asia Pacific, and Middle East & Africa. The North America peripherally inserted central catheters market is estimated to account for 81.5% revenue share of the global peripherally inserted central catheters market by 2016 end. This market is expected to register a CAGR of 4.2% over the forecast period. APAC and Europe are estimated to be the fastest growing markets in terms of CAGR. AngioDynamics Inc., C. R. Bard Inc., Teleflex Incorporated, B. Braun Melsungen AG, Medtronic plc, Vygon S.A, Cook Medical Inc., Argon Medical Devices Inc., Medical Component Inc., and Theragenics Corporation are some of the top companies operating in the global peripherally inserted central catheters market. Leading players operating in the global peripherally inserted central catheters market are collaborating with other key healthcare solutions and services providers in order to advance their operational efficiencies and provide improved patient care. The global peripherally inserted central catheters market is dominated by few key players such as Teleflex Incorporated, AngioDynamics Inc., C.R. Bard Inc., Vygon S.A, and Cook Medical Inc. and together, these companies constitute around 80%-85% of the overall market share.